Top-Flite engineers took the latest technology advances and combined them with an eye appealing classic style, the result is the best Top-Flite iron ever made. Introducing the new Top-Flite Tour iron. These irons will grab your attention with their performance and your playing partners will envy their premium looks. The new Top-Flite Tour irons are a combination of the latest in materials and design that yield maximum forgiveness, accuracy and consistency. This is my 5th set of Top Flir 2003 Tour irons. Got them in excellent condition for $39. They are easy to hit and very well built. got a change to pick some of these up on the recomendation of ColdTopper, i know there are a few fans 3OD included. These are a lot more forgiving than the Brosnan tour cavities that i was using with a lot less rust that affected spin a bit. chiping is easy and i can now hit a 5 iron just over a 100yrds a big improvement!! Pretty sure Benno and Ferrins will be all over these things when they find how good they are!!! I previously owned 3 sets of these and either traded or sold them! I just got another set in mint condition with regular flex, steel shafts. The Top Flite 2003 Tours are among the best irons I have ever used. Easy to hit with minimal offset and a thin top line. I will hold on to this set, as well as my Top Flite XL2000 set (which are also very good irons). These still hold their own with many of the new sets out there, including the Adams A4Rs. Adams A4R, Top Flite XL2000, Tommy Armour 845 Classics. Bought a set two years ago (2007). Got them with the graphite stiff shafts. That turned out to be a very good idea. I swing around 101mph. Paid $188 Cdn. on ebay. What a wonderful set of irons! Now I'm no expert but the stiff shafts work so much better for me. I dont work the ball but when I "pure" one it feels like I took a practice swing and there was no ball involved. The ball flight is good and my distance is improved. My 8-iron goes about 160yds. They do look cool in the bag and the topline suits my eye. Had my pw stolen and am pining for a replacement. Very difficult to find. If anyone knows where to locate a pw graphite stiff shaft PLEASE let me know. I'd buy another set of these IF I could find them. I demoed these when they first came out but didn't buy them because of the reputation that Top-Flite was a Kmart kind of brand. Years later, I started hearing the buzz about these but I was happy with my Mizuno Comp EZ irons. I finally gave in to the hype and bought a set. Now my right leg is sore from kicking myself for not buying them 6 years ago. They are VERY forgiving and strike a good balance between garden tools and a player's club. There isn't much difference in ball flight between a good and not so good shot as long as you don't miss by more than 3/8 of an inch, which is pretty darn good. And you can still work the ball. The stock steel (Rifle) shafts have a good feel on all shots and are really sweet on the flushed ones. You can tell when and where you missed a shot but there is no harsh feel. So don't be like me and miss out on a great set of irons at an incredible price because they aren't a status brand. Your scores will do all the talking for you. Mizuno Comp EZ, Bridgestone GC Mid, Dynacraft Prophet Forged and a bunch of others. I just picked up another set of 2003 Top Flite Tour irons, 3-PW, with stiff graphite shafts in very good condition for $39 on ebay. I previously bought two (2) brand new sets of these irons with regular steel shafts for a total of about $210. I bought the Top Flite tour irons with the graphite shafts because I was thinking of re-shafting one of two sets with the steel shafts. At $39 for a set already with graphite shafts, I felt I could not go wrong. I've use a lot of irons, and these suit my game very well. They are very well built, have a relatively thin topline, and the stock grips and shafts are also pretty good. I agree with the majority of the players who posted reviews here (and they were from all levels of players) that the Top Flite Tour 2003 Irons are an exceptional value and excellent irons. Sure, there are definitely clubs out there that may have a better feel, such as Mizuno's MX-900 Forged Irons (which can be bought brand new now for under $500), but why pay more when these irons seem to do the job very well. Callaway Big Bertha irons, Adams GT irons, Macgregor V-Foil M565 irons. I love the game but work doesn't allow me to practice more than 1hr/week and I only play Sunday mornings. On a "tight" par 69 course I regularly hit low 80's and play off 15. I put this down to my Top-flite tour irons which have to be the easiest and most playable irons ever made! I understand how people like to be seen with "in vogue" equipment but for less than £100 you can get a top-class looking and performing set of irons that in my opinion out-perform the alleged top manufactures. I used to play TaylorMade irons. Two years ago I was looking for replacement of my TaylorMade set then decided to give the Top-Flite irons a try after reviewing good comments about the Top-Flite set and for $100 I don't think the lost would be significant if did not work out for me. Well, turned out the irons set has been staying in my bag for over two years now. They are very forgiving, and easy to hit. Ball flight is a bit higher than my TM irons. However the iron spins the ball well to bite on green fairly decent. 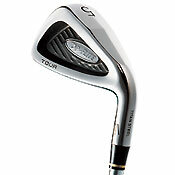 To me, the TF iron set is well built and costs only at a 10th of fraction to a TM or Callaway or Ping set. This TF set definately is going to stay in my bag for a long time to come. It is a big shame that Top Flite no longer makes these irons. Taylor Made Burner Oversize. Callaway BB.